The tunnel rail system in the Swedish capital is more than 105 km long. Almost all of the 100 stations are decorated with magnificent mosaics, paintings, sculptures and installations by over 150 different artists. Back in 1933, there were 2 tram lines, then by 1950, the first official underground train line had been opened, and 7 years later the first artworks were installed. In the 1960s, many of the stations were made by concrete, but the artists of the next decade began to cover the exposed bedrock with layer of sprayed concrete, giving a surreal look to many of the stations and escalators. Today, every station has its own unique look and atmosphere. 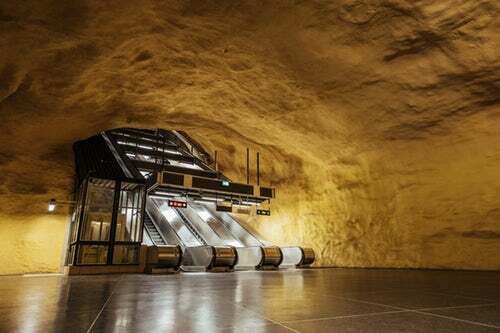 For example, Tekniska Högskolan station looks like a cave. In the other stations, the art explodes not only from the ceiling, but also from the walls and ground. There are technical diagrams on the floor, or cloud-filled cubs at Solna Strand, for instance. Other stations look like ancient monuments.